On view in the Thinkspace Project Room is Timewarp, featuring new works by Netherlandish artist TikToy in the artist’s first solo project with the gallery. 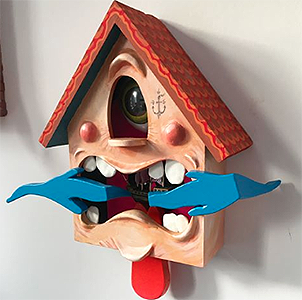 An anonymous street artist based out of Holland, TikToy creates playfully surreal character clocks, sculptures recalling psychedelic cuckoo fixtures. Inspired by the aesthetic freedom of street art, pop surrealism, and graffiti, his cartoon-inspired, sculptural interventions are staged throughout cities worldwide in unexpected recesses and its less-traveled nooks. Recurring motifs and elements appear throughout TikToy’s playful public sculptural practice, including the use of kinetic moving parts, often activated by external elements like wind, sun, and rain, and the presence of recurring characters. The artist has a preference for bright, high contrast, primary color based, graphic palettes, while a single looming eye tends to personify the clocks in a vaguely apotropaic way. The profusion of directional arrows, a motif TikToy had explored in earlier paintings, contributes to the inherent sense of referential chaos present in the handcrafted, wood objects themselves. Fascinated by the inner workings of mechanical clocks since his youth, Tiktoy’s timepieces are cleverly irreverent and existential. Like absurd reminders of time’s inevitable passing, they range in feeling from celebratory trophy to confrontational marker, and even in extreme iterations as grotesque talisman. TikToy revels in the poignancy of a simple extended, object-based metaphor.